On the same day the iPhone 7 and 7 Plus became available for pre-order, KGI Securities analyst Ming-Chi Kuo has released a new research report outlining his expectations for a dual rear camera in next year's iPhone model. According to Kuo, cost considerations and a niche appeal for the dual camera, which is found only on the larger iPhone 7 Plus model this year, mean that the feature is likely to remain exclusive to "high-end" models in 2017 as well. Presumably this means the dual camera would again appear only on so-called "iPhone 8 Plus" models should Apple continue to offer similar product lineups. While an attractive addition for avid picture takers and professional photographers, the iPhone 7 Plus dual-camera is not a mass-market killer application yet. Along with its high cost (estimated at over US$30-40) and the necessity for Apple to enhance the added value of high-end iPhone models, we expect only high-end new iPhone models (30-40% of them) to have a dual-camera next year. As for what improvements can be anticipated for the dual camera in 2017, Kuo indicates that optical image stabilization (OIS) is likely to be added to the telephoto camera. 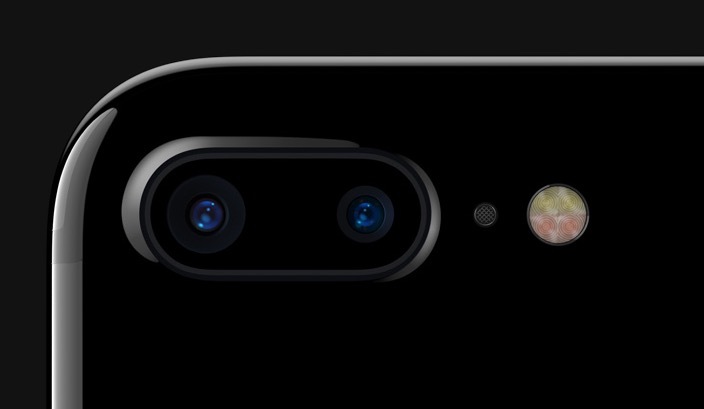 In the iPhone 7 Plus, only the wide-angle camera has OIS. Note that for the dual- camera of iPhone 7 Plus, wide-angle CCM is equipped with optical image stabilization (OIS) VCM, while telephoto CCM only comes with general VCM. We believe the focus of the dual-camera upgrade will be equipping telephoto CCM with OIS CCM, so as to significantly enhance optical and digital zoom quality. While 2017 would normally be considered an "S cycle" for the iPhone that would focus on internal improvements rather than changes to the external appearance of the device, rumors have suggested Apple is embarking on a major "iPhone 8" or "iPhone X" upgrade as the iPhone turns ten years old. Apple is reportedly looking to move to a glass body and a flexible edge-to-edge OLED display that curves around the sides of the device. The 2017 iPhone may also see the removal of the iconic Home button and perhaps include features such as wireless charging and an iris scanner. Very innovative. Couldn't make a waterproof phone with a headphone jack but Sony and Samsung have been doing it for years... now they cant add the camera to regular sized phones? I don't call this courage, I call it incompetence. "As for what improvements can be anticipated for the dual camera in 2017, Kuo indicates that optical image stabilization (OIS) is likely to be added to the telephoto camera. In the iPhone 7 Plus, only the wide-angle camera has OIS." Well that kind of blows, the 56mm 2.8 second camera is 1-1/3rd stop slower and magnifies the image twice as much, it needs OIS more than the wide angle one does, LOL!! Pretty sure it's triple cam next year. Maybe you are just too young, but back in the day when Steve Jobs was alive and well there was such a thing as a 17inch Powerbook and even a 17 inch macbook pro. Both of these had more advanced features than their 15 inch counterparts. For no good reason. If you wanted the more "pro" features you had to go for the biggest model. And people complained the same way they do now. Only back then they didnt have the very convenient "jobs would not/would have" whine card. In any case, buy the phone that does what you need it to. Apple has always been one of the most profit seeking companies out there. The reason I continue to support them is because I believe their stuff is the best out there. Even with their many shortfalls. Hold up, steady on with factually remembering truths. These days, it's far easier to just hate on this website. Very innovative. Couldn't make a waterproof phone with a headphone jack. They said it helps them make the phone water-resistant. Not that they couldn't do it without the change. But the main points they made were Lightning, wireless and internal space. You can disagree that those are good reasons, but they aren't totally illogical. I'm not defending Apple, but nothing is stopping you from using the Lighting headphones that come free in the box, using the adapter with any wired set or buying and brand of Bluetooth headphones. There are many companies that are not Beats or Apple who make them. Bose to name one. And as a last result you could switch to Android or use a 6s or SE—many options.